ummmm.....chocolate! Bring it on. 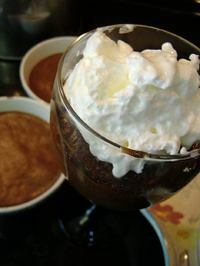 Your Choclate Mousse recipe sounds like our dessert today....especially like the strong coffee addition great for a Starbuck fan... try Gold Coast with its delicious bold flavor. If you and your readers love chocolate you'll be intrigued by the creative college student baker at http://thestudentstomach.blogspot.com she has some really appetizing chocolate recipes and photos including her yummy Brown-ka-roons! Check it out! By the way...."Chocolateshow" is coming to New York City on November 10-13. You may know that it is modeled after the famous Salon du Chocolat in Paris! Awesome! I'll have to give that a shot. Hey, so glad you are back. Thought that you had deserted your loyal readers. Missed reading yr stuff terribly.